Falmouth, Massachusetts (CNN) -- The Rev. William Eddy stands at the bow of his 53-foot sailboat nestled in the postcard setting of Cape Cod. A lifelong resident of the Cape and islands, Eddy built his staysail schooner by hand, and on this day, he's using it as his pulpit. A perfect storm, he says, has been brewing over the past decade among residents driven to hysterics by the idea of building the nation's first offshore wind farm in the middle of Nantucket Sound. Eddy loves everything about the Cape: the iconic shingled homes, the Norman Rockwell small towns and the pristine beauty of the sea. Most of all, the Episcopal priest loves the magnificent winds. And he thinks it's a moral imperative to harness those winds. He's told his congregation just that -- and watched some walk out on his sermon. "Father, we all would've stayed if you had just preached about Darfur," one member told him. Eddy is unbowed. "It's a no-brainer," he said of the wind farm. "I keep on wondering what's going to happen down there in Washington: Are they going to crucify this project on a cross of coal? Or are they going to stand up for what they've said they're going to stand up for?" For those whose views differ from Eddy's -- including, apparently, some of his flock -- the pristine beauty he extols is the point. Nantucket Sound, they say, is an iconic symbol of America, not an industrial park. Might as well plop a bunch of wind turbines in the middle of the Grand Canyon, they say. "It's an area that absolutely should be off-limits," said Audra Parker, president and CEO of the Alliance to Protect Nantucket Sound. Wind farms produce roughly 2 percent of the nation's energy, all from land-based facilities in California, Texas, Oklahoma, Wyoming and a few other states. Locations offshore are considered optimal because the winds are stronger and more consistent. Even the project's opponents acknowledge that the Sound is rich in an inexhaustible resource that could power the region. Horseshoe Shoal, where the turbines would be located, is shallow, the winds are constant, and the islands of Nantucket and Martha's Vineyard provide a barrier from large waves. There's no doubt the project would bring a new vista to the horizon. 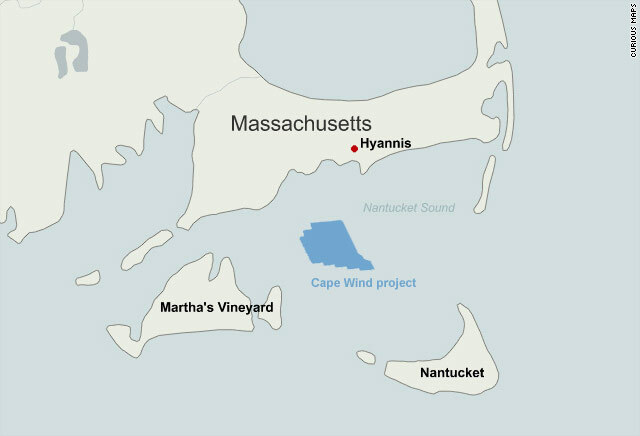 The 130 turbines, spaced a third- to a half-mile apart, would cover about 25 of the 500 square miles of Nantucket Sound. They would stand more than 40 stories tall, bigger than the Statue of Liberty and well over 10 times taller than nearly every other structure around the Cape. They'd be several miles out in the Sound but within view from some locations. The wind farm would bring hundreds of jobs and provide up to 75 percent of the power needed by the Cape and islands, according to Cape Wind, the company behind the project. When you believe in your heart that you have the right project ... you just keep putting one foot in front of the other. It wouldn't necessarily bring cheaper electricity, but it would be cleaner and a model for the rest of America, Cape Wind says. The Cape currently gets much of its power from a nearby coal and natural gas plant. The battle over the venture -- dozens of public hearings and nine years long -- has split members of American Indian tribes and pitted some of the nation's wealthiest people against each other. Liberals have squared off against fellow liberals. The most notable opponent was the late Sen. Ted Kennedy, whose family compound would have a view of the wind farm. The late Walter Cronkite also raised objections to those "big ugly things," although he later said he preferred to remain neutral on the issue. Seventeen state and federal agencies, including the Coast Guard, the Federal Aviation Administration and the Energy Department, have weighed in. An 800-page government environmental impact report largely endorsed the wind farm, as did a follow-up review. The project also has withstood multiple challenges in court. But this month, the Advisory Council on Historic Preservation recommended that the project be shelved: It would be too pervasive and destructive on a historic community. The decision now rests in the hands of one man: Interior Secretary Ken Salazar. He has the unenviable choice of cutting through nine years of regulatory red tape. He can greenlight the project or kill it. 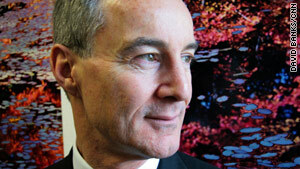 For Salazar, the wind farm proposal is a perfect storm as well. It represents a collision of Interior Department priorities: green energy, Native American heritage and eco-concerns over fisheries and bird life. The Cape will soon learn which is the top priority. Salazar has said he will make his decision by the end of April. At the far end of Martha's Vineyard, miles from the wealthy tourist districts, Cheryl Andrews-Malthais strolls along the road and fetches a sign from the bushes outside her tribe's property. "Nantucket Sound NOT for sale," the sign says, with a slash through a picture of a wind turbine. Cheryl Andrews-Malthais, the chairwoman of an American Indian tribe, objects to the wind farm. The ritual has become weekly, sometimes daily. Supporters of the offshore wind farm stop at the reservation's edge, yank out the anti-wind turbine signs and hurl them on the ground. Andrews-Malthais then puts them back. "You just shake your head and wonder why people think they have a right to do this," Andrews-Malthais, chairwoman of the Wampanoag Tribe of Gay Head (Aquinnah), said as she dusted off a sign. 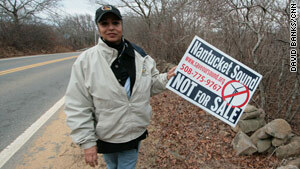 Her tribe and the Mashpee Wampanoag tribe on Cape Cod have become vocal opponents of the wind farm. The tribes say that Horseshoe Shoal is sacred ancestral ground and that the turbines would interfere with important sunrise ceremonies that date back centuries. So heated is the atmosphere, she says, that her tribe was offered what she feels was a payoff to keep quiet: $1 million, to be paid in installments of $50,000 over 20 years, she says. That anyone would put a price on tribal rituals is bad enough, she says. "Our history and our culture are not for sale." But most outrageous, she says, was the source of the offer: a tribal member. Jeffrey Madison is the son and grandson of medicine men -- and a lawyer who represents Cape Wind. His father is such a beloved figure of the tribe that his image is printed on T-shirts for sale at its main office. "There's no price that we can put on our culture. What type of legacy would we leave to our unborn children and our future generations?" Andrews-Malthais asked. "Our ancestors fought very hard and sacrificed a great deal in protecting what's important to us." Madison acknowledges he did make the offer on behalf of Cape Wind as part of a good faith effort. Shortly after he met with his tribe, he sent a letter to the interior secretary, saying it was complete "fiction" that the tribe considers the wind farm location vital to sunrise ceremonies. "I never participated in, witnessed or even heard of a sacred spot on the horizon that is relevant to any Aquinnah Wampanoag culture, history or ceremony," he wrote. He told CNN, "I stand by what I said in my letter. I know what I said to be the truth." Cape Wind would say only that it has explored mitigation efforts with the tribes. "We found out they make their own decisions," Cape Wind CEO Jim Gordon said. Opponents of the wind farm cite a litany of other reasons: navigation concerns for commercial fishermen and ferries, historic preservation, the further clogging of a heavily trafficked body of water, a potential drop in tourism, and air travel concerns. The FAA has said the wind turbines might interfere with radar. The exhaustive government review examined many of these concerns and determined that they weren't enough to stop the project. Yet the opponents remain unwavering. Our history and our culture are not for sale. Jim Powell, 49, stands near the ferry docking station on the vineyard. He is a 12th-generation resident of the island whose roots there date to 1642. He's proud of his heritage and the way Martha's Vineyard has always sought a balance between competing forces: tourists and residents, historic preservation and economic development. The scene around him is one of beauty: A quaint town with magnificent homes and shops and a gorgeous view. Powell spins around and points at the Sound. He's highly suspicious of Cape Wind. He wonders: Should a private company be allowed to make tens of millions of dollars in those waters? "The view you see here is very similar to the way it's looked for the last 350 years," he said. "To stick a major industrial complex right in the middle of the fishing spawning grounds and in the middle of the transportation routes, it's going to be a major detriment. "The benefits don't outweigh the detriments," said Powell, a member of the Martha's Vineyard Commission. Added Parker, of the Alliance to Protect Nantucket Sound: "It poses a significant risk to the millions of passengers that travel by boat in Nantucket Sound, the commercial fishermen who are earning their livelihoods there and the hundreds of thousands of flights that are going over Nantucket Sound." Parker and the others say the community backs an alternate location, a little farther away. They don't mention that the government reviewed that location but found the current spot is better suited. Greenpeace, the Sierra Club and other environmental groups endorse the wind farm: It's clean, efficient and necessary for the nation to move forward. The Energy Department released a report in 2008 called "20 Percent Wind Energy by 2030." It said 18 percent of the nation's wind energy should come from offshore sites. Neighboring states are closely monitoring what happens with Cape Wind. Barbara Hill of Clean Power Now says, "It's critically important that we do this." 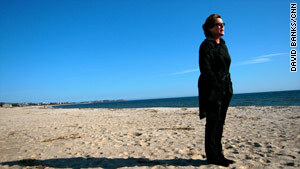 Barbara Hill points from an overlook on Cape Cod, not too far from the water's edge. The sun is beaming, and you can see for miles across the Sound. The wind whips about constantly. Hill focuses into the distance on a data tower, several miles from the shore. The tower is about half the height of the proposed 440-foot-tall turbines for the wind farm. Even on a clear day, you have to squint to see it. Hill roars with laughter. "You can hardly see it," said Hill, executive director of Clean Power Now, a group co-founded by Eddy, the Episcopal priest. The opponents throw out red herring after red herring, she says, and at the core is NIMBYism: Not In My Back Yard. "The only thing that has any merit," Hill said, "is that you're going to see it." And on smoggy days, you probably won't be able to see the turbines at all, she says. "It's critically important that we do this," Hill said. "It's a bellwether for new industry in this country." Billionaire energy giant William Koch sits on the board of the Alliance to Protect Nantucket Sound. Hill says that raises all sorts of questions: Does the Alliance object to the project on its merits, or is it protecting the fossil fuel industry? "It's a disgrace," she said. Koch, who has a home on the Cape, once told Forbes, "Why would you want to sail in a forest of windmills?" Brad Goldstein, Koch's spokesman at The Oxbow Group, told CNN: "They can question [Koch's] motives all they want. It has nothing to do about competing business interests in Massachusetts, because we have no business interest in the Commonwealth of Massachusetts." "Cape Wind is a bad economic investment," he said, adding that electric rates will increase on the Cape. "While I respect their free speech, I question their economics acumen. ... If the government makes this decision, it's another foolish decision." The wind farm has been one of the most heavily vetted energy projects in the world. Cape Wind first sought a permit in fall 2001. During that time, China built its first offshore wind farm. Nine other countries have offshore farms: Belgium, Denmark, Finland, Germany, Ireland, the Netherlands, Norway, Sweden and the United Kingdom. Reports in England have said some offshore turbines may be sinking as a result of a design flaw, and that investigators are examining the extent of the problem. Cape Wind CEO Jim Gordon: "America can join the race in offshore wind." In downtown Boston, Cape Wind CEO Gordon sits in his headquarters. Little wind turbines, about the size of trophies, adorn desks, and posters of the giant structures are all about. He's energized by the project, a pioneer forging ahead on something that could shape America for decades to come. Cape Wind has spent $45 million without even a single turbine being constructed; his opponents, the Alliance, says it has a war chest of more than $20 million. He never anticipated the battle to drag on for nine years. "There's been moments of frustration," he said, "but when you believe in your heart that you have the right project at the right place at the right time, you just keep putting one foot in front of the other. "If we don't move forward with projects like Cape Wind, then we're just prolonging and worsening our environment and our economic and energy security," he said. "America can join the race in offshore wind." To meet the concerns of his opponents, he says, archeologists will be on-site if native American artifacts are found, and commercial and recreational fishermen will be allowed to navigate through the shoal. "The whole idea of this exhaustive process was to determine where the best location was to put America's first offshore wind farm. And we know Horseshoe Shoal is." Of Interior Secretary Salazar, he said, "I am confident he will make the right decision." Back at the docks in Falmouth, Eddy smiles at the thought of sailing his vessel through the wind farm. He's so enthralled by wind, he once built a turbine to power his home. The priest christened that windmill on July 4, 1976, the nation's bicentennial celebration. "That was then; this is now," he said. "This is big time." CNN's David Banks contributed to this report.